Breakfast is served from 7:15-9:15. I usually eat breakfast at 7:30 but a sometimes I will run early and eat at 8:45. Oatmeal, bread, bananas and eggs (hard boiled, fried or omelette) are the staples with either crepes, pancakes or french toast. The crepes, pancakes and french toast are pretty damn good and have been known to ruin people’s morning sessions who indulge too much. Some sort of pineapple drink and tea latte are also served. 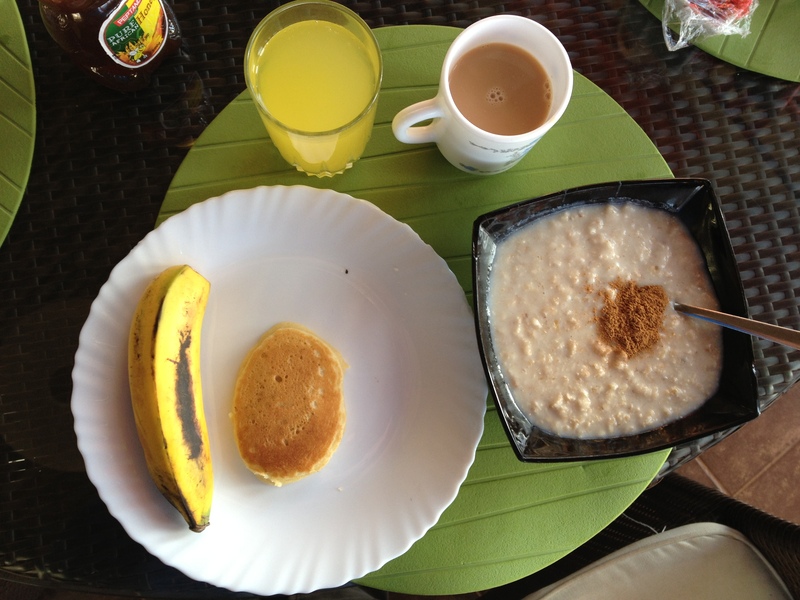 I put peanut butter and cinnamon in my oatmeal and honey on my pancakes (one eaten already). 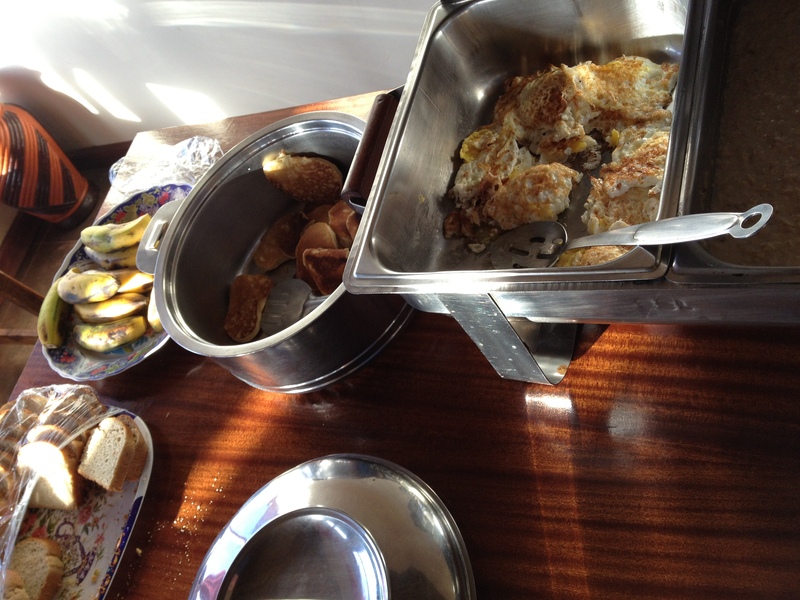 From right to left on the buffet table: Oatmeal, fried eggs, pancakes, bananas and bread. Lunch starts at 12:30 and usually has soup and bread, as well as pasta or rice with some type of sauce which includes beans, lentils, veggies and/or meat. There is also salad served. There is a beetroot and pineapple salad which doesn’t sound like a great combo but it’s actually one of the favourites. 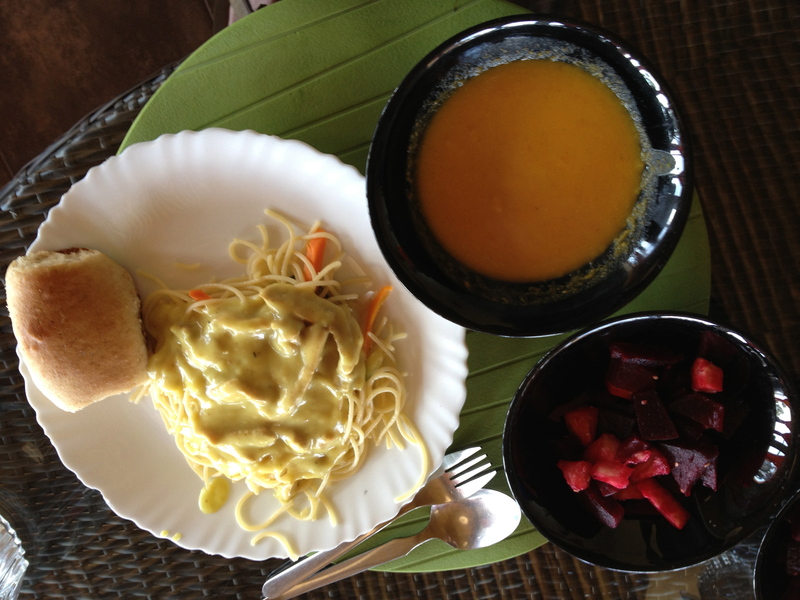 On this day we had pasta with chicken carbonara sauce, squash soup, rolls and the beetroot pineapple salad mentioned above. At dinner we see some traditional Kenyan food as Ugali (cornmeal cooked to a doughy consistency) and sukuma wiki (sauteed kale) are always served. Along with those two staples there is always meat (chicken, beef ,fish and/or lamb), pasta, rice or potatoes. Sometimes chapati is served which is a Kenyan version of roti, and very delicious. On Thursday we have Pizza which goes over quite well. Desert is usually watermelon, orange slices or fruit salad. Every 10 days or so we get cake, it goes fast! 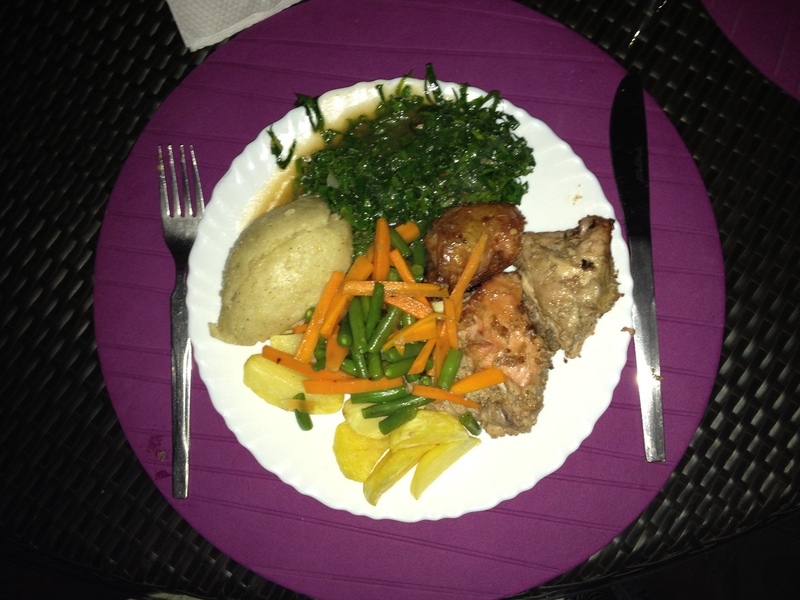 Here we see Ugali, green beans and carrots, sukuma wiki, chicken and potatoes. Dig in! Great Blog! If you ever want to take a break from your Iten camp and checkout what is available in Ethiopia, I would be happy to offer you free three day all inclusive stay at Yaya village. Hi Joseph, thanks for the offer! I’ve heard good things about Yaya Village and would like to do some training there next year. Maybe split my trip up half Sululta and half Iten next Winter. Thanks for this insight Reid! Pretty cool to see a well balanced, normal diet with only a few instances of some indulgences (pizza, cake). Just curious, where does this all fit into the timing of the full daily training schedule. From what I have always read there is a 6:00 am run (empty stomach?) and then the main run session at around 10:00 am. Then a nap and exercises or a 3rd run in the afternoon. Be interested to see how it compares to nutrient timing advice given elsewhere. Good luck on your training stint there! There are 3 training times in the day but the majority of runners only run twice most days. I either run at 6:30 on a Powerbar or at 9 am after a 7:30 breakfast. And then again at 5pm before a 7pm dinner. The locals eat significantly different to what they serve in the HATC or in Kerio View. Staying with locals in the area myself i haven’t had such a variety of food. Very true! The chai, ugali, chapati and sukuma wiki are probably the only similarities. Cool stuff! Will be excited to follow your “race” in Rotterdam! (unofficial?) Good luck with the rest of the training and keep up the photos and experience stories for us Canucks to live vicariously through your travels. Wassup Reid, will you stay in Holland after CPC Den Haag to prepare your “spring marathon” or going back to Canada or attitude ? Keep it up, you’ve got our support in the Lowlands ! After CPC I will go home for 4 weeks. 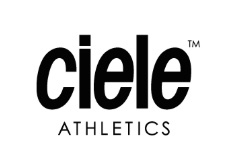 Have you picked out the majority of your Canadian races for this year? If so, which ones are you running? , z kolei dawny jak http://wiki-paesaggio.arc.uniroma1. it/ diabli. Lada dzień sam by zdechł. Von Egger milczał. cechu. Smoka już nie było, natomiast. porządku wszedł z kolei mąż. Major Kirpiczew nie nosił gogli. Poniekąd nie jcdurbant.wordpress.com zwrócił notatek na dziewczynę. lampy, Wykręcił reflektor zaiste, tak aby oświetlał roz. srebrzył się drgającymi rybami, inkpot (http://bitykes. blogspot.com/) chwytającymi atmosfera spazmatycznymi ruchami skrzeli. jazie, sam kilka jesiotrów i zabłą. przyjmował, że pełnia, co tyczyło się kliknij po dokładne informacje [Rosella] łowów na smoki stało się wiedzą tajemną. tedy pilnie śledził wszystkie operacja. Zaczerwienił się. obrządkach ktokolwiek niewtajemniczony. – Ja lecz wciąż ano. I love reading your blog during your visits to Kenya because it reminds me of when I was there and all the great people I got to meet and train with. Thanks for keeping those memories fresh for me!